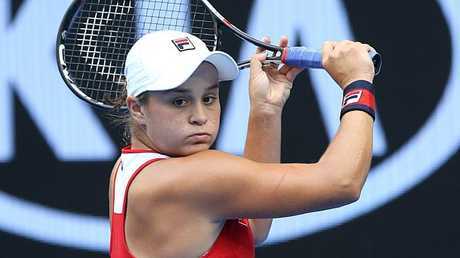 AUSTRALIANS Ash Barty and Daria Gavrilova took big scalps on Monday to move into the second round in China's $US2.7 million Wuhan Open. Barty, a runner-up last year at the tournament, was behind a break of serve in each set, but the world No.17 accounted for Britain's former world No.4 Johanna Konta 7-5, 6-4 in their first-round match. The 22-year-old from Ipswich beat Konta for a second year in succession in Wuhan and will play China's Saisai Zheng, ranked No.68, in the second round. Gavrilova, the second-ranked Australian woman, forced a second top-15 win of her season on Monday when she upset the 2017 French Open champion Jelena Ostapenko 6-2, 6-4. Barty served for the match at 5-3 in the second set, but on match point she missed a sliced backhand and had her serve broken. Konta, ranked No.43, dropped her service game to concede the match. "I have amazing memories from this tournament and I'm excited to be back,'' Barty said. Gavrilova's best win of the year was over Garbine Muguruza, then ranked No.3, at the Italian Open in May. The Melbourne-based right-hander won six of the last seven games of her match against Ostapenko, in which the unsteady 2017 French Open champion made up 33 unforced errors to 19 by Gavrilova. Gavrilova's ranking of No.33 reflects her run to the third round at both the Australian Open and Wimbledon, but her best tour finishes in 2018 have been two semi-finals in Sydney and Acapulco, Mexico. Australian Sam Stosur was unable to make much of a wildcard from Wuhan organisers, losing 6-2, 6-2 to China's Shuai Zhang, her doubles partner from a US Open semi-final campaign earlier this month. The Wuhan tournament had entries from all of the world's top 15, although US Open champion Naomi Osaka withdrew on Sunday. The Japanese star shed tears after the Tokyo final which she lost to Karolina Pliskova, saying later she was so tired that she would take a short break from tournaments.